3/10 Rutherford Rd, Seaford (MAP). Enter off Keppler Circuit. Plenty of street parking! Seaford Kindergym is a hidden gem! It's an inviting space, with a purpose designed gymnasium including squishy springboard floor and mats for soft landing surfaces and a variety of specialised equipment such as climbing frames, tunnels, wall bars, swings, ropes, ramps, rockers, and spinning devices! All of your creature comforts are attended to at our venue, with heating, bathroom and baby change facilities, kitchenette and comfortable, fenced lounge space with toys for the children. Class sizes: Classes are kept small to maximise engagement and are capped at 10 children/families per class. Music time: Our classes start and finish with group time on the mat. This is a time for Kodály music inspired singing, actions and games based on the gymnasium theme. We use individual hand-held items such as fabric balls, scarves, puppets and instruments and cooperative play items such as parachutes, beach balls and fabric. Movement time: The Gym's theme changes regularly to captivate children's interest. The equipment is set up to engage children on a journey of discovery, and in this way the environment acts as a teacher. Children are given the opportunity to use the equipment and their bodies as they choose. 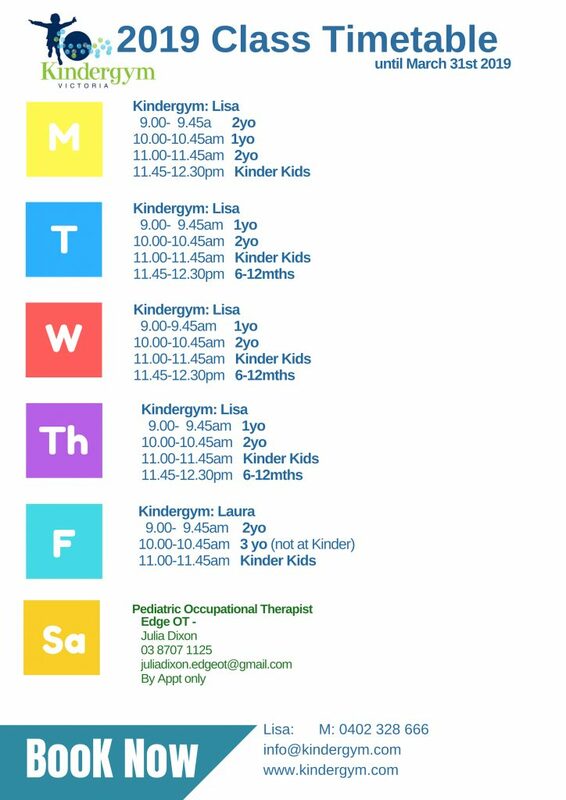 Educators: Qualified Kindergym Leaders scaffolds children's innate learning abilities and may focus on one equipment piece to support children in extending their skills, based on the child or group's interests on the day. Parents/Caregivers: When children feel safe and secure they are ready and wired to learn, and with this in mind our classes are designed for caregivers to work alongside their child. We welcome all types of caregivers: mums, dads, aunties, uncles, grandparents, foster carers or childcare professionals to accompany the child in their care. Connection: We warmly encourage you to spend time in our comfortable fenced lounge for a complimentary tea or coffee after class and chat with other families while the children play. Please bring a snack for your child to enjoy. If you are lucky the Coffee Van will arrive in time for a real cappuccino! Classes run from first day of the school year right through until Summer holidays with no school term breaks. Classes do not run on public holidays. You can purchase your class passes and membership via our online shop, and pay via direct debit, credit card or simply pay cash on the day. Pre-payment of classes is advised, as classes frequently book out.